Holy Week is perhaps the longest week in the life of the church. The anticipation builds as Easter approaches. The church buzzes with activity. Preparations are made for our many services. Once we arrive at Good Friday, we are ready to rush into Easter Day. We are ready to see the bare sanctuary adorned with the beauty of Easter. However, we are not quite to Easter yet. Between Good Friday and Easter Day is Holy Saturday—a day to sit and wait. The Holy Saturday liturgy is a time for us to pause; it allows us a moment to process what has happened on Good Friday. We sit with the disciples in our sorrow at the death our Lord. We imagine what it what was like for the disciples on the day in between Christ’s Death and Resurrection. We also consider what Jesus was doing between his Death and Resurrection. Holy Saturday gives us two paradoxical imagines: Jesus resting and Jesus active. Our Gospel reading and the Collect for Holy Saturday describe Jesus’ burial and his rest in the garden on the Sabbath. We also say an anthem from the Burial Office as our participation in the burial of Jesus. Jesus is also described as active between his Passion and his rising again. The Apostles’ Creed says, “He descended to the dead”, (or in the traditional language, “He descended into hell”). What happen there is known as the harrowing of hell. Jesus freed from hades (that is the place of the dead) those who died before his death. This is described in two verses in 1 Peter: “[Christ] went and made a proclamation to the spirits in prison” (1 Peter 3:19) and “For this reason the gospel was proclaimed even to the dead” (1 Peter 4:6). The harrow of hell will be the focus of the homily, which will be a reading from an ancient homily. After the service, we will decorate the church for Easter. We hope that you will come and join this Saturday! This Sunday begins Holy Week, and while it should be apparent from the very name, Holy Week is the most sacred time of year for Christians. We pay particular importance to the latter part of the week, Maundy Thursday through Easter Day, but that doesn’t mean the first part of the week should be overlooked. We begin with Palm Sunday. This year (weather permitting, of course) we will gather on the lawn along Washington Avenue, inside the black wrought iron fence. We have in the past used Daffin Park, but we always worry about crossing that intersection, so this seems safer. There we will bless and distribute the palms and begin the liturgy. At this point, our focus is on Christ’s entry into Jerusalem - we are exuberant and hopeful. As we process into the church, we will stop the procession for a prayer that marks a change in the mood of the day. We finish the procession still with palms, but at this point we should start to realize that underneath the chants of “Hosannah!” lies the shout “Crucify him!” No other liturgy in the year has this sudden shift, and I trust we will pay attention to it. Monday through Wednesday we will gather at 7pm in the sanctuary - that space inside the altar rail - for Eucharist. These services are simple and fairly informal, without music or fanfare. They are part of our weeklong procession to the cross and give us glimpses into this significant portion of the life of Jesus. Maundy Thursday is the day we celebrate the gift of the Lord’s Supper, of Holy Communion. It is in some ways the most joyful moment in Holy Week but, at the end, one of the most somber as well. We leave the Lord’s table and follow him into the garden to await the difficult times ahead. At St. Michael’s we follow the custom of washing one another’s feet, as our Lord commanded us to do. Remember he didn’t suggest or encourage; he commanded us - “as I have washed your feet, you also are to wash one another’s.” This service also begins at 7pm, but we sit in our normal seats in the nave (the area with the pews.) Although, if you wanted to sit down front, regardless of where your normal seat is, that would be lovely. After the service you are invited to stay an keep watch in the Gardner Room, where we will have reserve the elements of Communion for Good Friday. On Good Friday we have three services, one at 12 noon and another at 7pm. We hear the Passion Gospel read again, and we sit at the foot of the cross. It is a difficult day, but our presence on this day is our gift to our Lord for what he has done for us. At 6:00pm we have Stations of the Cross. This year we will hold a service on Holy Saturday that we have not done before, at least not for quite some time. That service will be the subject of next week’s post. 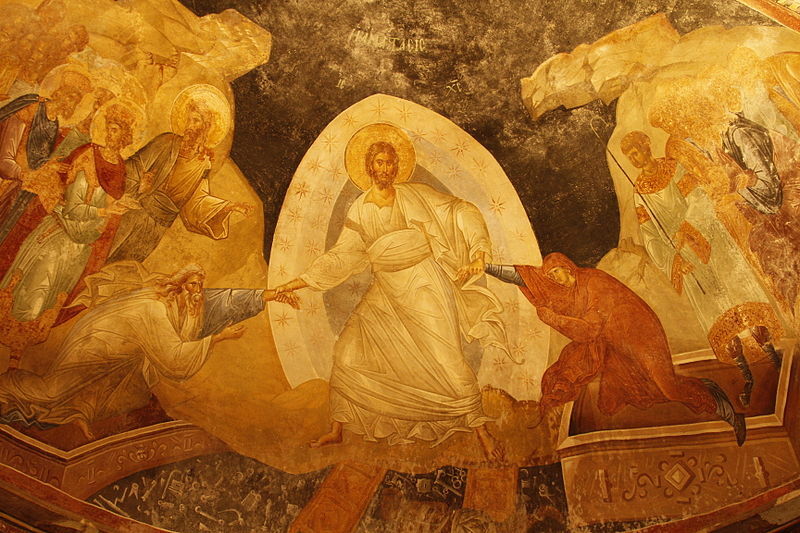 Finally we arrive at Easter Day, the Day of Resurrection. This year we are doing something different here as well. 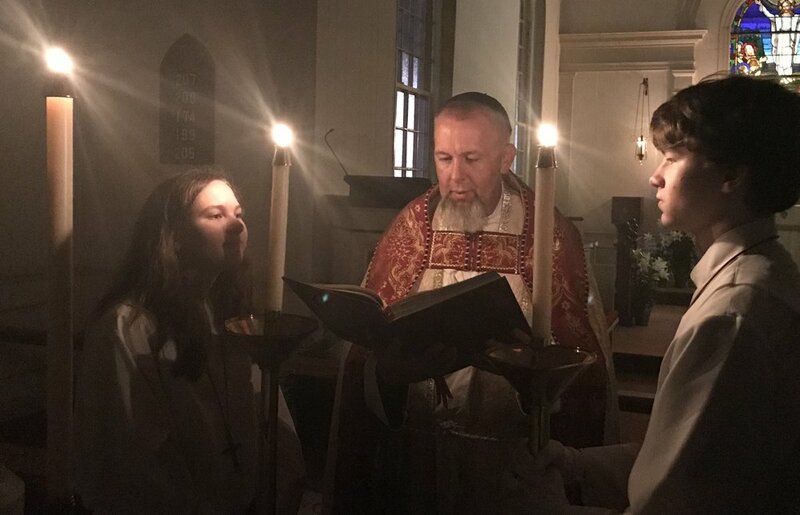 The Great Vigil of Easter begins in the dark at 6:00am. We will gather (again weather permitting) in the same place we did on Palm Sunday, to kindle the new fire in the darkness. Then we process into the church by candlelight to hear in Holy Scripture the work of redemption rough by God throughout the ages. As the sun comes up, the lights come on, and we welcome with joy the resurrection of our Savior. Breakfast follows the service in Patton Hall, so please bring something yummy to share. Following our meal together, we will have an Easter Egg Hunt on the grounds of the church, and then at last, our 10:30 celebration of Eucharist. All our lives as Christians find their meaning in the events of this week. While we like to say that Christians are “Easter People,” we are really “Holy Week AND Easter People.” I hope you will take part this coming week as much as you are able. For the Sundays in Lent, we have been and will continue to say the Decalogue towards the beginning of the service. The Decalogue literally means the ten words. It is perhaps better known as the Ten Commandments. We use the Decalogue in the service before we confess our sins to remind ourselves of the many ways we have sinned against God and our neighbor. Q. What do we learn from these commandments? A. We learn two things: our duty to God, and our duty to our neighbors. Q. What is our duty to God? IV And to set aside regular times for worship, prayer, and the study of God's ways. Q. What is our duty to our neighbors? X To resist temptations to envy, greed, and jealousy; to rejoice in other people's gifts and graces; and to do our duty for the love of God, who has called us into fellowship with him. Q. What is the purpose of the Ten Commandments? A. The Ten Commandments were given to define our relationship with God and our neighbors. Q. Since we do not fully obey them, are they useful at all? A. Since we do not fully obey them, we see more clearly our sin and our need for redemption. Since this Sunday is the first Sunday in Lent, we will begin the service with the Great Litany. It is called the “Great Litany” to distinguish it from other litanies in the Book of Common Prayer, such as the Litany of Penitence that we said on Ash Wednesday. Because of its penitential tone, the Litany is especially appropriate during Lent. But it is more than just a penitential prayer. Through it, we pray for all sorts and conditions of people. Prayer is an important part of Lent. We pray for ourselves. We pray for others. We pray for the world. We pray prayers of repentance and prayers for healing for the wounds of sin. The Great Litany is one of the ways we do this. Consider what you might need prayers for or those close to you might need prayers for and come this Sunday to pray for them as we pray the Great Litany together. This Sunday is the Last Sunday after the Epiphany; Lent begins this week, on Wednesday, which is Ash Wednesday. Because this Sunday is the last one before Lent starts, it’s also the last time we’ll be using the ancient shout of praise, Alleluia, until Easter. Alleluia, the Latin form of the Hebrew word Halleluyah, literally means “Praise ye (you) the Lord” and has from ancient times in the Church been associated with Easter. Subsequently, it is not used in the liturgy during Lent, when we focus on our sinfulness, our need for forgiveness and redemption, and the repentance that goes along with recognizing that need. Alleluia is often jokingly referred to during Lent as “the A word” since we’re not supposed to say it. In seminary the choir wouldn’t even sing it in rehearsal during the Lenten season, instead substituting the phrase, “Lord have mercy,” which has the same number of syllables and the same emphasized syllables. When the choir director first told us that’s what we’d be doing, I think half the choir thought he was joking. He wasn’t. Because we’re coming to the end of the Alleluias for a while, it is customary on this the Last Sunday after the Epiphany to sing hymns that are heavy with the word. So this Sunday, if you come to the 10:30 service, sing them with gusto. At both services, we have the opportunity to say it one more time, at the fraction - “Alleluia. Christ our Passover is sacrificed for us/Therefore let us keep the feast. Alleluia.” So say it like you mean it. You won’t get another chance for a while. We are drawing to the close of the season after Epiphany; Lent is just around the corner. The theme of this season has been revelation, specifically the revealing of Jesus as the Light of the world, as our Savior. I’ve been thinking a lot about light lately. We have a light fixture over our table at home, one with three bulbs on three equally spaced arms. For whatever reason, one of the bulbs always burns out faster than the other two, and we’ve realized that when it goes out, we hardly notice. The change in total light output from three bulbs to two isn’t that great, apparently. But when a second bulb goes out, when we’re down to just one, the room is suddenly noticeably darker. That’s generally when I climb up onto a chair and change out both bulbs. Invariably, I’m surprised by how much brighter the room is with all three burning. I don’t notice the difference going from three down to two, but i do notice going up from two to three. I’m not sure what it says about our eyes and brain, but it’s clear to me that I notice an increase in light more than I notice a decrease. We often find ourselves in dark moments, and I wonder how long it takes us to notice. I suspect it’s not usually a sudden change, as it is when a bulb goes out, but probably much more gradual until we reach a threshold and we become aware. That’s generally when we become a little more earnest and consistent in our prayers, or at least it is for me. That’s when I start looking for an epiphany, for God’s presence to be revealed in my life in a way that I wasn’t noticing. My preference at these moments would be for the kind of revelation we’re going to hear about in the gospel next week - what we call the Transfiguration, when Jesus suddenly appears in dazzling light before his disciples atop a mountain. That’s rarely how it works, though. What I find much more often, in those times I’m specifically praying for God to shine into the dark places of my life, is that the response is much more subtle. I find in those times that when God is revealed, it is generally by shining just enough light for me to see the next step to take. When I am willing to step forward in faith, I see that the light extends a bit further than I could see before, and the next step lies in front of me again. I am reminded that, in the darkness, even a slight increase in light is infinitely noticeable. The following article was written by Bardin Hooks, a member of the Bishop Search Committee from Americas. It’s an excellent write up about the process so far. It’s been edited to include information about the Savannah Listening Session. Please note the link to an online survey in that paragraph and here. The Standing Committee of the Diocese of Georgia has appointed a 12-member Bishop Search Committee charged with presenting a slate of candidates to be considered for the Eleventh Bishop of Georgia at the Diocesan Convention in November 2019. The Search Committee includes one clergy representative and one lay representative from each of the six convocations of our Diocese. I have been appointed as the lay representative for the Albany Convocation, and The Rev. Tar Drazdowski (Christ Episcopal Church, Cordele) is our convocation’s clergy representative. The Search Committee is working closely with our search process consultant The Rev. Canon Rick Callaway, a former canon in the Diocese of Atlanta and a veteran consultant of many bishop searches throughout the country. The Search Committee held its first meeting on January 18-19 at the Collegiate Church of St. Paul the Apostle, Savannah, in conjunction with the Standing Committee. We have since had our second meeting on February 2 at Christ Episcopal Church, Cordele. The Search Committee will continue to meet regularly over the next several months, culminating with a final meeting in late August to select the slate of candidates for consideration at the November Convention. The initial work of the Search Committee has been focused on creating a Diocesan Profile, which will be completed in April. The purpose of the profile is to present a broad survey of our Diocese – who we are, what we’re about, and where we’re going. The aim of the profile is to provide an accurate picture of our Diocese and attract talented candidates for our next bishop. After the publication of the Diocesan Profile, formal nominations will be open from May 1 to May 31. The Search Committee expects to receive 10-20 (or more) names during the nomination process. After all nominations have been submitted, the Search Committee will conduct a thorough individual review of each nominee. This process will culminate with a retreat for select candidates, which will be held from August 11-15 at Honey Creek. Following the retreat, the Search Committee will deliberate and produce a slate of 4-5 candidates, which will be announced on September 1. The nominated candidates will then do “walk-abouts” (visiting local parishes) throughout the Diocese prior to the election at the Convention on November 15-16. That is not to mention our weekly programs and activities. We’ve had a busy few weeks here at St. Michael’s and we’re already looking ahead to Shrove Tuesday, Ash Wednesday, Lent, etc. It can be easy to be caught up in the busyness of life. We all seem to do it. Our society and culture encourage us to be busy. It came be hard to slow down and enjoy the moments that God gives us. We are in the last few weeks of the season after the Epiphany. It is a season to focus on how Jesus and God’s glory are revealed to us. Sometimes, Jesus is revealed to us in big ways; sometimes, it is in ordinary things. We must slow down if we are to see how Jesus is working in our lives. If we pay attention, we can see Christ in the people around us—our family, friends, coworkers, and strangers. If we look around us, we can notice God’s glory in the whole creation: in the singing birds just outside our office or the squirrels scampering in our yard or the leaves on the trees swaying in the wind. God’s glory is in all these things. How might God be showing God’s self to you? 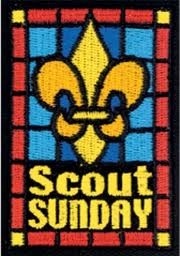 This Sunday, February 3, is Scout Sunday. Parent, leaders, and Scouts of all ages from our BSA units will be with us at our 10:30 service. As usual, Scouts will take part in the service as lectors, acolytes, and ushers. Because of some other events on the Scouts’ calendar last year, we celebrated Scout Sunday on the same Sunday as our Annual Meeting. Much to our dismay, we had to ask them to excuse us after the service ended, so we could get on with our Parish Meeting and with lunch. This year, we want to handle Sunday differently. We’ve invited the Scouts and their attendant adults to join us for lunch after the 10:30 service. BBQ is being provided for them, and we will handle the drinks as well. So - because it’s been SUCH a long time since we’ve had lunch following a Sunday service - we’re asking folks (once again) to bring either a side dish, vegetarian entree, or dessert to go along with pork BBQ. Fear not - the Scouts and their families will also be contributing dishes to the lunch, so we don’t have to try to find a ravenous pack (and troop) of Scouts all on our own. Please come honor our Scouts, and please bring your favorite dish to share at lunch. Our Parish Annual Meeting is coming up the last Sunday of this month, January 27, following the joint 10:00am service. During that meeting, the congregation will elect three people to three-year terms on the Vestry. The Nominating Committee is pleased to present to you the slate of nominees they have received; their names and some biographical information is below, as well as each nominees response to the same question: "What are your hopes and dreams for St. Michael's in the coming three years?" Please feel free to contact any of the nominees if you have questions for them or if you would just like to get to know them better. The Nominating Committee and Vestry have determined that each of the candidates satisfies the requirements of the canons and by-laws to serve, and each nominee has agreed to stand for election. We have five members nominated for three spots. As always, there will be an opportunity for nominations from the floor, but before you nominate anyone, please make sure you have their permission to do so, that they agree to serve if elected, and that they satisfy the requirements to serve on the Vestry of St. Michael's. According to our by-laws, members 18 years or older who are communicants in good standing are eligible to serve, with two exceptions - those living in the same household or who are immediate family members (parent, child, sibling, or spouse) of current Vestry members, and any outgoing member of the Vestry who has served a full term. A communicant in good standing is defined as a member who "unless for good cause prevented, for the last year has been faithful in attendance and in working, praying, and giving for the spread of the Kingdom." I ask that between now and the annual meeting we please hold these four angels in our prayers, including prayers of thanksgiving for their willingness to serve our congregation. I am a lifelong Episcopalian, husband of Holly for 45 years, father of three, grandfather of seven and a retired banker. We moved to Pooler early in 2018 from Rhode Island, where we had lived for 35 years. Our search for a church home led us to SM&AA last spring. I have served on two vestries - at Church of Our Savior, a parish similar to St. Michael’s in Arlington, MA and at St. Luke’s in East Greenwich, RI where we were members for 35 years. I served 12 years on the board of St. Mary’s Home for Children, an agency serving abused children in Rhode Island. In East Greenwich, I served 12 years on the school board, including six as chair, and two years as president of the town council. At St. Michael’s, I am a lay reader and volunteered at the Christmas tree sale. St. Michael’s is a wonderful place. It attracted Holly and me quite quickly with its warmth and its sense of purpose. I would like to see St. Michael’s attract more young members to provide continuity for the sense of belonging that new members like us feel. Holly and I journey from Pooler to attend services, as other travel from outside the neighborhood. St. Michael’s can think of itself as a magnet parish attracting Episcopalians and others from a wide area who are seeking to serve Christ as part of a wonderful, welcoming community. The capital campaign funds need to be well spent to provide outward and visible signs that we are a vibrant parish. Judy has been married to her husband Joe for 39 years this July. They have one daughter, Barbara, who lives in Ramona, CA with her husband Dorian and Judy’s grandson TJ. Judy was born in Washington, DC and has lived in several places along the East Coast. 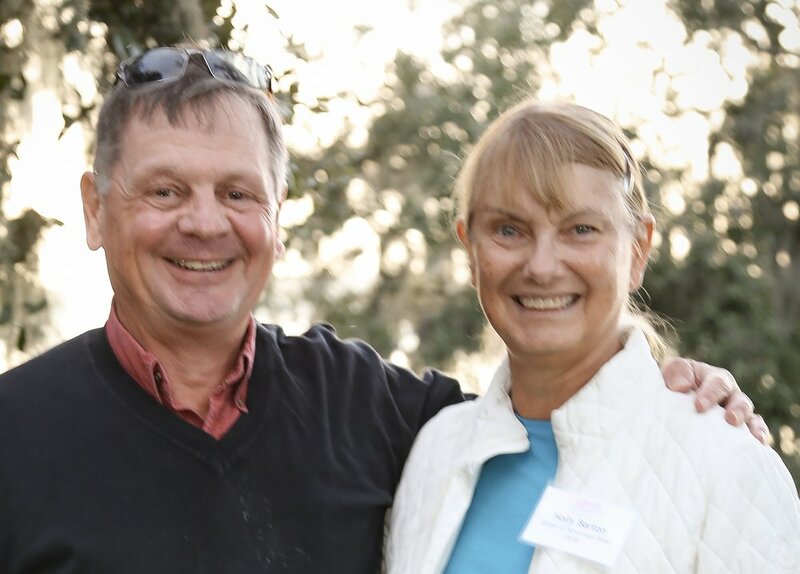 She and Joe settled in Savannah about 26 years ago, so they think of it as their hometown now. For the previous nine years, Judy was a caregiver to a very special lady whom she dearly misses now. Before that, she owned her own quilt shop, Let’s Sew. She still enjoys quilting and going to quilt shows. Of course, she can’t leave out that she’s semi-retired and that she runs the I AM Food Pantry here at St. Michael’s. Over the next three years, Judy hopes to continue working on her strength and compassion for others that will leave a lasting and positive impact on the lives of those who walk through our doors. David has been a member of St. Michael and All Angels since 2013. You may recognize him when he's holding or chasing one of his two boys, Everett and Wendell, or when he's standing next to his wife, Kim. Otherwise he's pretty unremarkable. David has been involved with the Christmas tree sale since 2014 and had a hand in updating the church website to its current form in 2015. 1. Growing its relationships with the various groups that share our space, especially our Scouting programs. 2. Becoming even more integrated into our surrounding neighborhoods and the greater Savannah community. 3. Creating new opportunities for fellowship for our parishioners. Barbara E. Medeiros is the Chief Financial Officer for Georgia Regional Hospital at Savannah. She received her BS from UC Hayward and her MBA from Wilmington College. She has spent her financial career working in communications, environmental service, and health care. When she is not mulling over financial statement she enjoys quilting, gardening, and being outdoors. She currently resides in Savannah with her father and son. She has attended the 8:00 am service at St. Michael’s for a little over a year and serves as a LEM (Lay Eucharistic Minister) at the 8am service for the past 5 months. She sees her next 3 years at St. Michael’s answering God’s calling in any area that is needed: continuing as a LEM, doing weekly reading, utilizing her financial experience, and serving in any area of St. Michaels that may be needed, along with growing her relationship with God and her St. Michael’s family. My family and I have been members of St Michaels for over 35 years. I have been on the vestry 4 times, once serving as Senior Warden. I have been our convocation’s representative on Diocesan council 3 times. I have been elected by our Diocese 3 times to serve as Deputy to General Convention, once as alternate and twice as the Deputy. I am a cradle Episcopalian. My hopes and dreams for St. Michael’s for the next three years are to grow spiritually and physically. We need to get the word out who Jesus is and how His word can help all of us be better people, people who Jesus would be proud of. We all need to bring someone to St. Michael’s and show them what just what a few of us are doing for the community. As we enter into the season following The Epiphany at St. Michael’s, remember that at the 10:30 service for the next several Sundays we will be using a trial liturgy approved by The General Convention last summer. The idea behind these liturgies is not to replace The Book of Common Prayer but to offer an additional option for congregations to use. Furthermore, as their title suggests, these liturgies don’t try to replace language we already use but to expand our stock of images, words, and ideas we use to describe our experience with the Living God who is beyond anything that we can say. Our goal at St. Michael’s is to respond to the request made by The General Convention - to try these liturgies in our congregation, see what our experience of them is, and then offer our feedback to a diocesan committee, who will in turn send feedback from all congregations in the diocese to a church-wide Task Force. So, how does this work? Starting this Sunday, instead of using the Prayer Book, we will have a booklet with the service printed in it. (See photo above). It should be a fairly seamless entry into the service; just follow along as you would in the Prayer Book. The congregation’s parts will be printed in bold text; the celebrant’s or other leaders’ parts will be in plain text. So if it’s bold, you read it. We will still have the regular inserts for the collect and readings, and will have a folded one-page “bulletin” with the order of service, hymns, prayer list, and announcements. I encourage you over the next several weeks to pay attention to what’s going on inside your mind and soul as we pray our way through these liturgies. What about them stands out for you? Where do you notice differences? What among those differences is a help to prayer and worship? What gets in the way? The first week or two may be awkward; anything new always is, especially when it comes to church, but please stick with it. I encourage you also to take notes about your experience, even while you are in church, so that you don’t later forget things that came to you in the moment. The Last Sunday after the Epiphany is March 3, and that will be the last Sunday we use them. On March 6, Ash Wednesday, we will return to the Book of Common Prayer. We will have some times outside of church for those who wish to discuss our experience with these liturgies. I hope you will take part in those as you can. Note: Not an actual first century photo. This Sunday, January 6, is the Feast of the Epiphany of our Lord. It is the celebration of the coming of the Magi who have followed a star to Jesus. While our tradition tells us that there were three of them - and they even have names - the Gospel doesn’t mention a number, so in truth we don’t know how many actually showed up. In any case, i’m sure it was pretty spectacular when they did. Of central importance to the story of the Epiphany is the ethnicity of the Magi - they are not Jewish; they are foreigners, outside of the promises God had long made to the descendants of Abraham. Even so, they recognize Jesus and come to worship him. In parts of the Eastern Church, Christmas is celebrated on this day, marking the day the Messiah is revealed to the world beyond the people of Israel. One of the traditions that has grown up around this feast is the “Chalking of the Door,” a manner of asking God’s blessing upon your home for the coming year. On Sunday, there will be chalk and an order of service available for any who wish to continue this tradition for 2019. Okay, so the photo above isn’t exactly related to our upcoming Annual Meeting, but it is a lovely shot of our church on Christmas Eve, and I thought it was worth sharing. Hope you are having a Merry Christmas this year. Our Annual Meeting is coming up on January 27, with one service at 10:00am, followed by lunch and then the meeting in Patton Hall. At the meeting we will receive reports on the state of the parish, present a 2019 budget, and elect three new members to the Vestry. The Nominating Committee will present the names of five parishioners who have agreed to stand for election. Of these five, we need to elect three. Their names, in alphabetical order, are Chuck Barton, Judy Berube, Barbara Medeiros, Bill Steinhauser, and David Tanner. In a future post we will include photos and a brief bio for each nominee. Nominations may also be made from the floor during the Annual Meeting; if you wish to nominate someone, please make sure that they meet the requirements to serve on Vestry and that they are willing to serve if elected. If you have questions about that, please speak to Fr. Kevin or to Georgia Fogarty. Last week we told you what was coming up around St. Michael and All Angels. We’re getting close to being ready for Christmas. For the last two days, our Angels emptied, sorted, stacked, and stored almost 600 bags of groceries brought in by the Callahan Food Drive. These people are nothing short of amazing! A few of them are pictured above; to them and the others whose pics we didn’t get - Thank You So Much!!!! 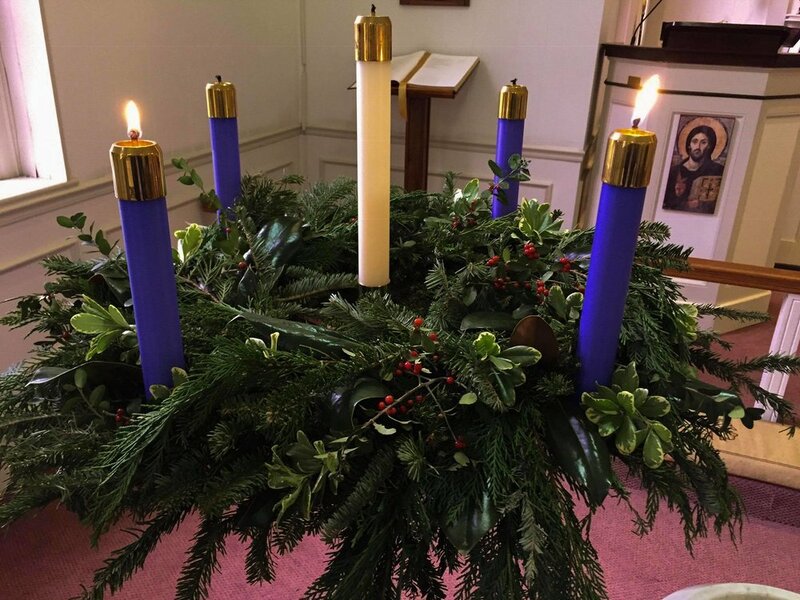 This Sunday is the 4th (and last) Sunday of Advent. Monday is Christmas Eve, so there’s one last big push to get ready. Following the 10:30 service we decorate the church, and we need your help. There’s lots to do, so please join in the fun!!! Ok, it isn’t Christmas yet. We’re close but not quite there. That said, we are getting ready for it, both to worship our Lord and King at the commemoration of His birth and to receive Him when we encounter Him in the world outside the walls of our sanctuary. Here’s what’s going on, and I invite you to take part in our preparations for Christmas. Mysterious Santa - New stuffed animals can be brought into the church any time the church office is open, and on Sundays. Decorations for Christmas Eve - December 17 and 19 at 5:30pm - we will begin assembling the window treatments and other decorations. Don Callahan Food Drive - December 20 & 21, 9:30a-3:30p - come help stack, sort, and store all the canned goods that our neighborhoods will be bringing in. Greening the Church - December 23, following the 10:30 service - we bring in and set up the decorations we made earlier in the week. Meeting in July, The General Convention of the Episcopal Church considered and declined to proceed with a revision of the 1979 Book of Common Prayer. Instead, the Convention authorized for trial use a set of “expansive-language liturgies” for what we now know as Eucharistic Prayers A, B, and D. The approved use of these liturgies was left to the discretion of each bishop in his or her own diocese, and all diocese were urged “to create a liturgical commission to collect, reflect, teach and share these resources with” a task force formed by Convention. Our bishop has approved the use of these prayers as of the First Sunday in Advent (this past Sunday). I would like us to follow the request of The General Convention and give these liturgies a try here at St. Michael’s. I propose that we do so for the season following The Epiphany, beginning January 13 and going until the last Sunday before Lent, March 3. As the liturgies are only written in Rite II, we would use them only at the 10:30 service. Our 8:00 Rite I service will remain unchanged. I know the mention of “trial liturgies” can ignite strong feelings, both positive and negative, so let me lay out the approach I want to take. First of all, the point of these trials is not to decide if we want to use them long term at St. Michael’s but to use them for a limited time, to pray them faithfully, and see how they “sit” with us. We may find them beautiful and effective means of encountering and worshipping the living God; we may not. Whichever we decide, I’d like us to provide some solid, constructive feedback to the commission about our experience. To do that means that we need to give them a fair shake. To help us accomplish this goal, we will be taking a close look at the liturgy we’re going to be using for Epiphany season during the Rector’s Forum on Sunday mornings, starting this Sunday. There are many options provided, and I want your input on what we should use and when. We need honest opinions and feedback; it’s okay not to like the trial liturgies, but we need to be able to say what we don’t like about them and why. We also may find we like parts of them but not others. Please remember, this is only for a few weeks; come Lent, we will go back to our Prayer Book for Sunday worship at both services. We will be producing booklets with the full Sunday liturgies for our use. You won’t have to try to memorize anything or flip back and forth through extra pages trying to find our place in the service. I promise we will make this as seamless and easy as we can. I hope you’ll take part and help produce our report for the diocesan liturgical commission. This is what some of our angels may look like after this coming week at St. Michael’s. We have a lot to do, a short time to do it, and we need your help. Here’s what’s happening this week; jump in wherever you are able. Tomorrow - Saturday - at 8:00am we go into high gear for the Christmas Tree lot build. Charlean Smith is heading up breakfast for the workers; we’re having breakfast casseroles, fruit, juice, and donuts. Contact Charlean if you can help buy, make, serve, or clean up afterwards. As soon as we’re well fed, we head over to Daffin to build the tree lot; there’s lots to do, and we can use you. At some point tomorrow - we’re still trying to pin down a time from the nursery - our trees will be delivered, and we’ve got to get them unloaded, counted, and sorted. Sunday - we gather all the food to go in the Thanksgiving bags we start giving away on Tuesday. Here is what we still need, in volume: cranberry sauce, stuffing mix, cornbread mix, cake mix/frosting, and especially Thanksgiving-themed reusable grocery bags. We do have the hams we need at this point; we just need more of the list above. We’ll use as much as you can bring. Also, the 2019 Pledge Campaign Celebration takes place between services that morning. What if you haven’t turned in your pledge card yet? Bring it with you!!!!! Monday - we fill the Thanksgiving bags. We may actually have enough volunteers to accomplish this task by now, thanks to all of you who responded to the SignUp Genius request. Still, things could change, so if you’re around Monday morning, come on by. Tuesday - we start giving out the bags through the I AM Food Pantry. Friday - Christmas Tree Lot opens at 9:00am. Come help sell our trees! Of course, Thursday is Thanksgiving Day - so eat (but not too, too much), celebrate, and give thanks for all God has done for you. Below is the text of an email our Bishop sent out to the diocese today. It mirrors an address he shared at the end of Convention in Albany today. We will certainly talk about this at church tomorrow, so please bring any questions you might have with you. In the meantime, please keep the diocese, its Standing Committee, and our Bishop in your prayers. In the last year I've had some significant health setbacks. In my rehabilitation I've not been able to get back to 100%. My doctors and therapists have recently told me I never will. To be the bishop of a diocese of this size and scope, my experience tells me the bishop needs to be at 100% all the time. And you deserve such a bishop. It has been hard for me to admit this (pride being the worst of all sins), but I can no longer physically do what the bishop of this diocese must do. Thus, I have informed the Standing Committee I intend to resign as the Bishop of Georgia upon the successful election and consecration of my successor. The election will take place next year in Statesboro, on November 15-16. The consecration of the 11th Bishop of Georgia will be, God willing, on May 30, 2020. Your Standing Committee will oversee the discernment and election process. When bishops make an announcement such as this, the usual script they follow is to say how wonderfully healthy the diocese now is, how leaving when things are going so well is for the best, and then the bishop subtly works in all sorts of backdoor compliments for all the great things he thinks he's done. I won't insult your intelligence by doing that, nor will I subject you to what we all know to be at best half-truths. The truth is we're facing tremendous headwinds as a Church and, as of yet, we've not done what we need to do to adequately address them. We aren't evangelizing as we must and our stewardship isn't strong enough to be sustaining in the long-term. Over the next 18 months I will continue to put my heart and soul into this vocation. My schedule, however, will need some further adjustments due to my ongoing physical challenges. There will be no "lame duck" anything. If I hear: "we'll have to wait until the new bishop is here," then I will say "no" and we'll move forward. God's Mission won't be suspended over the next 18 months. Nine years ago, you gave me a privilege I didn't deserve and that was to serve as your bishop. Other than my marriage to Kelly and the gift of our three children, your gift to me has been the most precious of my lifetime. I thank you for entrusting this office to my care and oversight. I ask your forgiveness for the many times I failed to be the bishop you needed. In all things, you have shown me grace upon grace and you have honored me in giving me this trust and responsibility. In keeping with this celebration, I encourage you to be thinking about who those saints might be in your own life. When you come to church on Sunday, you will find at the back of the church alongside the regular Prayers of the People, a list of those names whom we will remember at the altar. Add the names you bring to the list, so we can include all the saints in the lives of our congregation. Two quick notes about attending this Sunday: it’s Time Change Sunday, so don’t forget to set your clocks back an hour before you go to bed Saturday night, and this is the Rock n Roll 5k this Sunday. When you arrive you will see signs saying you can’t park on Washington Avenue, but that will not be enforced until noon on Sunday. We’ll make sure to have you out of church by then, so park as you normally would. See you on Sunday! There is a solution, of course; it’s just not the one we hear about the most. The solution doesn’t lie in winning elections or changing laws, in appointing judges or demanding Congressional investigations. The solution will not come through persuasive arguments or cutting remarks. We will not bring about a change of heart by changing the minds of those who disagree with us. 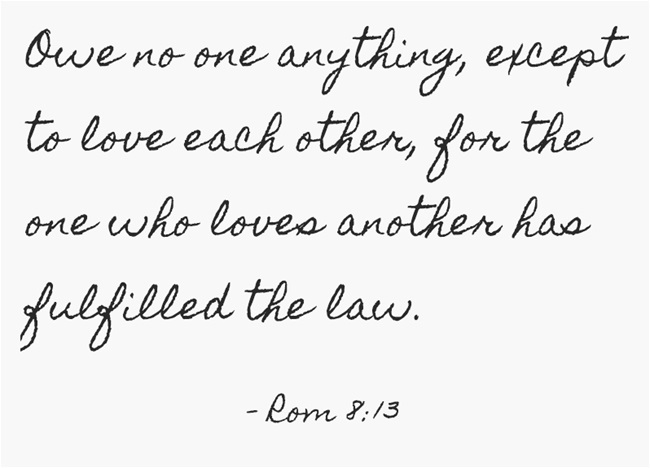 The solution, as every Christian should know, is only and exactly what Jesus taught - love. Love of God, love of neighbor, love of our enemies, love of those with differing political views - this is the burden that Jesus lays upon his followers. It does not allow for exceptions, conditions, or reservations. Love is simple in its being, but it is not always easy. It may not make us feel satisfied with the results, justified by its outcome, or even just better because we did it. None of those things is the point. Loving, especially when it requires something of us, reshapes us into the image of God stamped upon us at creation. It makes us more of the person we were created by God to be. It reveals the face of God to those around us. Love is the only power at our disposal that we cannot exhaust or misuse; it is, as Paul reminds us above, the only true debt we have, one which we owe not just to one another, but to the God who created us and taught us the meaning of love.